I have always been fairly obsessed with maximizing my life, I enjoy life and I would like to experience it to the fullest. Unfortunately, certain aspects such as money/jobs get in the way. For instance during high school and my first year of college I was part time clerk in a billing office and I would spend 10 – 40+ hours a week. My job consisted of scanning papers, pulling staples, entering records, and believe it or not there were actually people bad at this job. I thought to myself every day, how could I improve my productivity, how can I maximize how efficient I work. I would even change the layout of my desk to maximize the time it took me to move flip a paper, pretty lame I know. To be honest, the time I spent there made me realize how little people attempt to maximize their abilities. For example, my first week at the billing office one large black man who worked next to me would literally complete half the amount of work I would complete in a day, even though I just started. After about a couple of weeks of me completing twice as much work as him I spent a day plotting out what he did (all while working mind you). As it happens he was not only simply slow and inefficient, he made no effort to maximize anything. He was taking extra steps to complete the same tasks as me and from time to time I swear he fell asleep. The next day I mentioned to him how he could improve his productivity and he asked me “why would I want to do that?” He explained to me how he was paid the same regardless and no matter how hard he worked he was not going to benefit. I said fair enough and moved on, to me maximizing the efficiency of a task is closer to a religion, I was getting paid to do a job and I was going to do my best. I would spend ~800 hours per year working there (10 hours / week for 9 months, 40+ hours / week for three months). This does not include the hour drive each, during which I also listened to the audio book and lectures. I worked there for two months shy of 5 years. Assuming an average of 200,000 words per book/lecture series, this is likely lower, but I did listen to books such as the Bible (783,137+ words), Atlas Shrugged (500,000+ words), and several large lecture series. How Much Did I Maintain? It is hard to quantify exactly how much of this I maintained. Though I would argue that because I was fully engaged and interested in the book I retained far greater than the average high schooler or college student who likely either read the book rushed or spark noted the book. Further, I learned in an extremely relaxed environment. I was not required to learn anything, I was doing it at my own pace and would kind of escape my current boring predicament at work. I listened the equivalent of 46.08 / year novels from audiobook/lectures during this 5 year period. I read 82 textbooks/novels during this same time period or 16.4 / year. Meaning Total I read the equivalent to 62.12 textbooks/novels per year. and considering I potentially retained the information at least as well or better and definitely read/listened to a large number of technical books/lectures, it is fair to say that this method of optimization was successful. As many readers may suspect, while performing most jobs you cannot listen to recordings. However, those who do have repetitive tasks to perform usually can listen to recordings. As it happens they are often low paying jobs usually requiring little to no education. Meaning, individuals who are in the same predicament as I was would be able to improve their lives. What I find even more interesting, is that because people retain memories better when they can link them to something the more you learn the better you can remember. That being said, even if someone is uneducated and is completing a repetitive tasks, listening to audiobooks, they potentially can gain knowledge. Then if said person decides to go back to school (college) they could out perform many other students and improve their life significantly. Alternatively, their improved knowledge from recordings could help them invent something, start a restaurant or nothing. In any case, listening to recordings costs nothing, but it could have a large impact on your life, as I feel it has in mine. Driving to work: 1600.8 hrs, 5 days a week at 48 weeks and a 40 minute drive each way. Working out: 1750 hrs, 30 minute cardio and 30 minute muscle every evening or morning for 350 days of the year, for five years. **I altered the numbers for someone who was working full time, as opposed to me who was working only part time, though the work out numbers are fairly accurate during that 5 year timeframe (I stopped working out at that pace the last couple of years). Great write up. I’ve been doing this for the past year at my current job. I feel my knowledge has greatly improved. I would recommend listening to the 7 habits of highly effective people if you haven’t already. When you finish it. Let me know what you think. 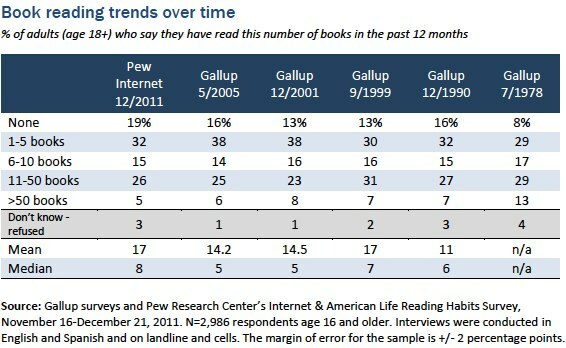 I will bet any amount of money that the people who answered that Gallup poll radically overestimated the amount they read. The median person reads 8 books a year? Right. I agree with you on the Gallup Poll. As for the wpm, I would not doubt that at all. I found 1.2x speed let me think about the book better. Sure, I can comprehend at 282 wpm, but somewhere between 180 – 200 wpm was more comfortable. However, you bring up an interesting point. Since I was discussing optimization this could have increased my “books/year” efficiency by 30% or so. Plus I am sure I would get more comfortable with it. I did this for 7 years as a security guard, and a year before that waving a sign for a pizza place. For a while I had read every hugo winning novel from 1950 to present day. I need to start again. It’s amazing how much you can learn! This is my favorite of all of the posts on this blog. I am happy I have found another “data junkie” – I too, listen to audio books while doing other things and have been looking for ways to improve my productivity. This was actually really fascinating. That is a lot of “optimization” that can occur. My one concern is the busy-ness of the mind. I feel it is valuable to learn to still my mind, to not require particular subject in front of me – to enjoy stillness and practice quieting myself. Do you think this is a good discipline? Would it be harder to accomplish this if you’re constantly filling your head up with information? I believe my way of thinking about the world is similar (when delivering newspapers as a kid I would cross streets diagonally to minimize walking distance). In recent years I have been stuck more and more between efficiency and effectiveness. This blog gives a great solution to maximizing words comprehended per year. I spend a lot of time (too much) thinking about which are the most useful words to comprehend. I have a large list of books to read which all come from book recommendations found online (reddit, hn) or in podcasts. I feel like the time spent finding interesting things significantly impacts the time comprehending interesting things. Have you thought about/solved this issue for yourself? Personally, I don’t try to find interesting things so much… I take recommendations of others and spend more time exploring. It’s easy to get stuck in a rut otherwise, may as well try to find interest in what is out there by relating it to my experiences or my other knowledge. That makes it more engaging to me.